Skeletal Fitness by Mirabai Holland is a one-on-one Weight Bearing Exercise workout video For Osteoporosis and Low Bone Mass, Osteopenia. Comes with water fillable hand weights-fill up to 3 pounds each. but never one that I could stick with until Skeletal Fitness. I love the variety and the intelligence of the workout. I am stronger and I even think I am taller. I am 63 and have been moderately active all my life but knew that I had to do more to strengthen my body to help prevent Osteoporosis. 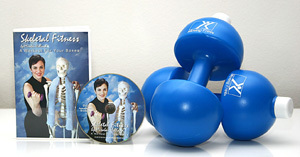 The Skeletal Fitness DVD is just perfect for me. Easy to follow and very through total body workout with special emphasis on the areas at risk for fracture. I also love the weights and I use them both for this workout as well as using them at the pool. Thank you. Having just received an osteopenia diagnosis I felt a bit discouraged. That is, until I ordered this DVD which has given me hope that it might be possible to stop the bone loss and begin building new bone mass. Mirabai does an excellent job of explaining the way our skeletal systems work. The exercise portion is very clear, thorough and moves at a good pace. I like how Mirabai explains exactly how each move is benefiting the body. I also like the gentle reminders to breathe and hold in the abs. The weights are an added bonus to an already great workout. I just finished doing the exercises in this dvd and loved it! Mirabai Holland's exercises are slow and easy for anyone over 50. She repeats the instructions, which are clear and concise. For anyone doing the dvd, Ms. Holland adjusts/modifies the exercise from easy to more difficult. I also like her precise explanations of why one is doing that particular exercise. Finally, I appreciate the info sections about bones and osteoporosis. I would recommend this dvd to anyone wanting to keep their bones strong. Another added bonus was the water/land weights that was included in the time-limited offer. I definitely got my money's worth in purchasing this item! My bones will thank you! The video and the weights are easy to use. I can feel myself getting stronger.